While studying electrical engineering, Nolan Bushnell worked nights as a carnival barker. A Utah inventor brought the world new kinds of fun: computer games and family-friendly restaurants with game facilities. His work on electronic entertainment led to a multibillion-dollar industry. 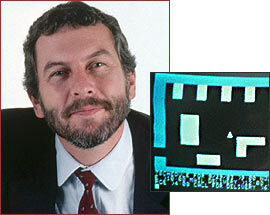 As the inventor of Pong, Nolan Bushnell is considered by many to be the "father of electronic gaming." He was born in Utah in 1943 and grew up a tinkerer, playing with electronic ignition systems and a roller-skate-mounted liquid fuel rocket in his garage. At age 15, he was forced to run the family concrete company for several months after his father's death. During his time at the University of Utah, he was a computer graphics student who loved games -- especially chess -- and he also worked at an amusement park. His activities helped him conceive of a new form of entertainment. Bushnell's breakthrough took place in the same era as other technological developments in computing, most notably the personal computer. In 1970, he invented the first computerized video game, Computer Space. Although it was rudimentary and cumbersome, the game developed into the now-legendary Pong the following year. This electronic version of ping-pong featured a ball that players bounced between two paddles using manual knobs. Players dropped quarters into the machine to start new games. The game became so popular that Bushnell founded a company, Atari, to market it and other products, like Asteroids. In 1975, Atari released a version of Pong that could be played on television sets, in partnership with Sears. The following year, Bushnell sold his company to Time Warner for $28 million. By 1982, it was a $2 billion cash cow. The new video game industry developed video arcades as well as computer-based games. Bushnell himself founded the Chuck E. Cheese's "entertainment restaurants," a nationwide chain of pizza parlors with video gaming for children and their parents. "There were insufficient places," Bushnell, a father of eight, would later explain, "that a family could go and young kids could play games in public places." Like Reno gambling legend Raymond Smith before him, Bushnell stayed focused on delivering fun to the masses. Since the mid-1980s, he has been involved with more technology start-ups; his latest venture, uWink, is an entertainment software company that develops games for a range of platforms, from cell phones to amusement parks.